At Gustavsberg, we have always worked hard to find new and smart solutions for a more sustainable production and over all use of our products. Our broad product range extends from water saving toilets to energy efficient mixers. We have long since been awarded environmental certification, and we show consideration for the environment throughout the products' life cycle - from product development and manufacture, to logistics and the finished bathroom. Simply by installing our products you can save energy, water and money. Although, sustainability for us is not only about the environment. It is also about a social responsibility which initially means creating a safe working environment for our employees and the installers who work with our products. The next step is a constant awareness of our production and how we can contribute to a more sustainable society. Because of our strive for a more sustainable future, Gustavsberg have enclosed a cooperation with WaterAid and is therefore taking an active part in helping people around the world to get a better life with clean water and sanitation. [Translate to Ukraine / Україна:] Our sustainability work permeates all areas of our business - from the initial project start-up to completion of the eco-smart bathroom that not only saves both energy and money, but is also gentle to the environment. [Translate to Ukraine / Україна:] Eco-smart products and good economics go hand in hand. For example, our energy and water-saving WCs have helped us achieve international sales successes. [Translate to Ukraine / Україна:] We have long been working on the development of eco-smart processes. In fact, we have had our own purification plant at our factory since as far back as 1968. And we have developed a system through which we use access heat from the firing ovens to heat our premises. [Translate to Ukraine / Україна:] Both our bathroom products and our packaging solutions are eco-friendly. For example, all our mixers are recyclable and largely made of recycled metal. We have also developed economical and eco-friendly packaging solutions that comprise less material. [Translate to Ukraine / Україна:] Our aim is constantly to improve, be innovative and develop long-term sustainable and eco-smart products. This is the key to our success. [Translate to Ukraine / Україна:] In our factory of taps and fittings we are recycling ventilation and heating energy from our casting klins. We do that through heat exchange functions. [Translate to Ukraine / Україна:] The heat for our Vårgårda factory comes from biofuel in the form of woodchip incineration at a plant just 500 metres away. We no longer use oil as a source of heat, which has not only reduced the environmental impact on the atmosphere, but has also helped eliminate the heavy deliveries of oil to our factories. [Translate to Ukraine / Україна:] We recycle production material both internally and externally. Rest products that are left overs from the production, for example chips and coolants, are taken care of and separated for recycling. [Translate to Ukraine / Україна:] We have decreased the usage and number of chemicals in our production. We use external expertise for the control of substances and are regularly working to find environmentally friendly substitutes. [Translate to Ukraine / Україна:] Through investments in the ventilation system, we are attacking dust emissions that are now much below the limits. We have also dealt with noise through various investments in new components in the ventilation systems as well as changed routines and times for usage of ventilation. We keep track of the water that we are releasing to our environment and that is well below the limits from the licensing authorities. [Translate to Ukraine / Україна:] The waste that is the result of the production is handled in cooperation with the supplier for waste management. Through the years we have dramatically reduced our waste from deponi and are recycling much more. [Translate to Ukraine / Україна:] The most economical flush uses 2,4 litres without compromising efficiency. Compare this to the WC models from the 1960s and 1970s, which used 9 litres of water per flush. [Translate to Ukraine / Україна:] The patented water-saving function featured in our mixers consists of an intricate little heat and flow block that saves huge amounts of energy. And money. [Translate to Ukraine / Україна:] When energy classification for mixers was presented in 2010 it was very welcome. At Gustavsberg we have been focusing on energy in our work for a long time. Nautic washbasin mixer got the highest grade (A) in the energy classification and got the best test result of all the washbasin mixers in the test. The same goes for Nautic kitchen mixer. It was - and still is - the best kitchen mixer of all tested kitchen mixers. Gustavsberg has energy classification on the Nautic and Logic ranges for washbasin and kitchen mixers (SS-820000). Since 2014 also Nauic thermostat mixers in combination with shower sets (SS-820001) have energy class A. [Translate to Ukraine / Україна:] All our mixers are recyclable. Moreover, they are largely made of recycled metal. When new mixers are installed, 95% of the old ones are recycled. The brass is made into new “raw material” that the brass factory uses to make rods and bars which go into the production of mixers. [Translate to Ukraine / Україна:] We have also developed economical and eco-friendly packaging solutions that comprise less material. One example is the award-winning packaging solution for our Nautic bathroom range. It comprises just two components – Styropor® and corrugated card – which are both simple to sort and reuse. 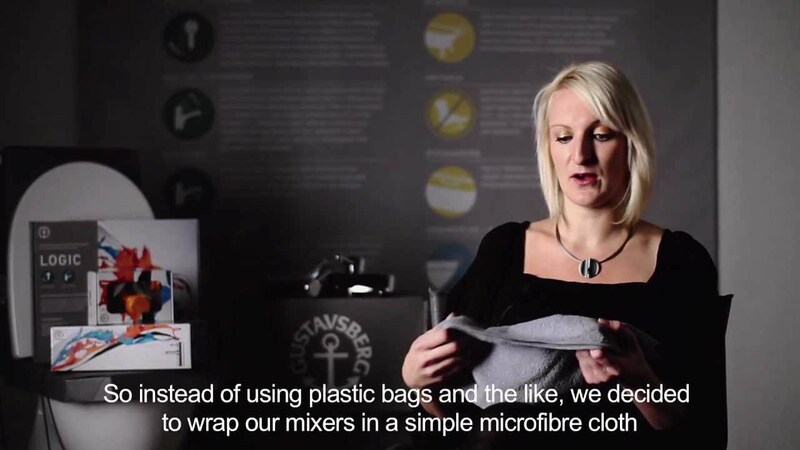 In addition, we wrap our mixers in microfibre cloths that end customers can use to clean their homes – and then recycle. [Translate to Ukraine / Україна:] Gustavsberg products are of the highest quality and are made to keep on working for many years. We stock Gustavsberg-brand parts for at least ten years after the product has been withdrawn from the range. [Translate to Ukraine / Україна:] Our Vårgårda factory manufactures mixers and the market-leading Vatette pipe connection system. The end production of WC:s takes place in Gustavsberg. [Translate to Ukraine / Україна:] Our suppliers need not actually be environmentally certified, but they must have an active environmental work programme that lives up to our requirements. We enter into a written agreement designed to guarantee that they take responsibility for their employees and the environment. [Translate to Ukraine / Україна:] We work with carriers who are pursuing clear, long-term strategies to reduce their environmental impact on an ongoing basis. [Translate to Ukraine / Україна:] We were awarded this international recognition of good packaging design for our eco-smart packaging solutions for the Nautic bathroom range. These solutions feature less material than previously, which facilitates recycling. They are also designed to be simple to store and handle, which reduces wear and tear damage at fitters. [Translate to Ukraine / Україна:] The patented water-saving function featured in our mixers has won the Swedish Energy Agency’s competition for resource-efficient tap water fittings. Thanks to the intricate little heat and flow block, which forms the very heart of our mixers, users can save huge amounts of energy and money.